The Freckles Collection of stitchery and appliqu� quilting patterns. Is That Santa? #TFCST120 . Is That Santa? Features three blocks of stitchery with reindeer parked on the rooftop, Santa climbing down the chimney & the stockings full of toys as well as a seasonal poem that's stitched into all three blocks. Measuring 48" x 23", this wall hanging has borders of scrap plaid strips & a checkerboard that are machine quilted with HO HO HO appliqued across the top. All patterns include a thread chart & use four basic stitches: Backstitch, Running Stitch, French Knot & Lazy Daisy. 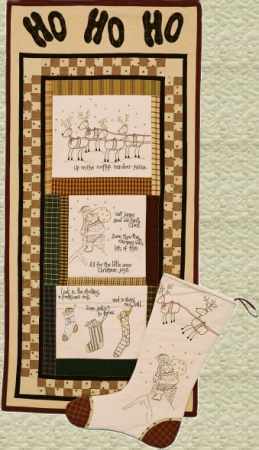 Pattern also includes a 19" stocking pattern that features Santa & his reindeer delivering their presents on Christmas Eve.